The "Black Panther" star may have been misquoted, but the response to the story is an excuse to put black folklore in context. As Vanity Fair’s cover profile, Michael B. Jordan provoked a storm of criticism with one line: “We don’t have any mythology, black mythology, or folklore. …Creating our own mythology is very important because … You help people dream.” Jordan likely knows that black folkore has a very long, rich history. It’s quite possible he had a more specific point in mind — frustrations over the lack of film and TV content that exploits black folklore — but the interviewer doesn’t make it explicitly clear with a follow-up question, leaving many to assume that the “Creed II” star meant exactly what he said. The actor has yet to make a public statement responding to the criticism, and he declined to comment for this story. However, rather than pillory Jordan over what he may or may not have meant, here’s a brief overview of black folklore to serve as introduction for the uninitiated. A disclaimer: Africa is home to many cultures, each with its own collection of myths and legends, although some cultural groups and regions do share common elements. A proper discussion of this expansive folklore would require far more than a single article. Films and TV series treat black history as if it began with the transatlantic slave trade. Of course, it didn’t; it’s a history that includes centuries of culture and tradition, which also isn’t taught in typical American classrooms. And since mass media also serves as mass education, it’s possible for any person to be unaware of the rich mythology that has long existed within the African diaspora. In addition, it could well be that the African tradition of the griot — storytellers who maintained oral history through generations — eroded as technology gained its preeminence. Parents no longer gather children to share those fables that were passed down from their parents and grandparents. However, the Vanity Fair profile does cite Jordan’s upbringing as featuring black nationalist parents, a focus on education, and deep commitment to the Pan-Africanist experience. At a minimum, that might suggest a broad familiarity with ancestry lore. There’s unrecognized genius in how Africans of the transatlantic slave trade created a vast repository of mythology that evolved from African folklore. They allegorized their trauma in story, preserving and disseminating African culture as a way to cope. When slaves arrived in the so-called “New World” in the 15th century, they brought an extensive oral tradition. The African trickster hare became Brer Rabbit in the US, later popularized in the late 1800’s by the first major collector and publisher of African-American folklore, Joel Chandler Harris. Thanks to “Uncle Remus, His Songs and His Sayings: The Folklore of the Old Plantation,” it preserved a significant collection of oral tales that inspired future works. Toni Morrison’s novel “Tar Baby” (1981) can be considered a revisionist critique of Harris’ “The Wonderful Tar-Baby Story,” and filmmaker Ralph Bakshi’s controversial live-action/animated satire “Coonskin” (1975) skewers Harris’ Brer Rabbit fables from the “Uncle Remus” collection. Even though most slaveholders suppressed their cultural norms, African slaves often used storytelling (sometimes through song) as a means of expression and cultural values, as they did for centuries prior to their enslavement. Slaves also sometimes used folktales to share secret information, like plans to escape. Early attempts to document these traditions included the “Uncle Remus” collection, but Harris’ critical reputation is mixed at best; he was accused of misappropriating African American culture. By contrast, in 1935, Zora Neale Hurston published “Mules and Men,” a work that could serve as a counterpoint to “Remus” providing a glimpse into the oral folktale traditions of poor, Southern black people whose culture in a segregated society was rarely documented. Hampton Institute (now Hampton University), a historically black college in Hampton, Va., launched America’s first predominately black folklore society in 1893. Prominent black intellectuals of the day championed the Hampton Folklore Society, which was devoted to the identification, collection, study, and distribution of black folklore, and argued for the acknowledgement of black mythology as a source for African-American literature. This challenged dominant Western literary models, and promoted an African-American literary tradition. Over a century later, this continues to be a recurring theme, as people of African descent worldwide strive to uphold cultural artifacts that are uniquely their own. The details of Igbo Landing aren’t entirely clear, because it was passed down by oral tradition. One popular folklore based on the event tells of the slaves not drowning, but instead walking on water, returning to their homeland. Additionally, Toni Morrison’s “Song of Solomon” (1977) is grounded in the mythology of slaves literally taking flight to return to their African origins, and Julie Dash’s seminal film “Daughters of the Dust” (1991) summons the Igbo Landing mythology. African folklore has even gone mainstream in the US. 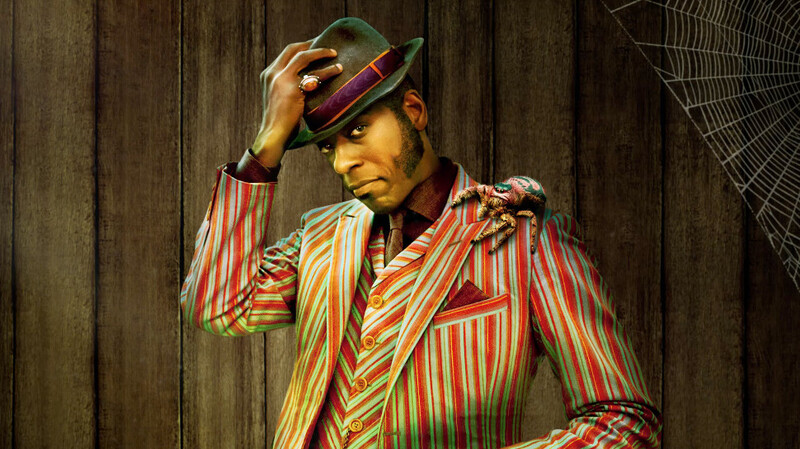 In Neil Gaiman’s “American Gods” (2001) and its follow-up “Anansi Boys” (2005), the West African trickster god Anansi is reimagined as “Mr. Nancy.” In the 2017 Starz TV series adaptation of “American Gods,” the character is played with verve by Orlando Jones. Disney’s 2002 animated anthology film “American Legends” is a compilation of previously released animated musical shorts based on American folklore and features the story of John Henry, the African-American folk hero. According to legend, Henry’s prowess as a steel driver was measured in a race against a steam-powered machine, which he won only to die in victory, hammer in hand, as his heart collapsed from exhaustion. Traditionally told through song, the story exists in several versions. Additionally, many notable musicians have recorded John Henry ballads, including Johnny Cash and Bruce Springsteen. Two years ago, the Starz network also put into development a supernatural series inspired by the Afro-Cuban religion Santeria, which is based on a fusion of different Yoruba (a Nigerian ethnic group) folklore and Roman Catholicism, which grew out of the slave trade in Cuba. So for Jordan, and for producers hunting for the ever-elusive IP, here’s an extraordinary opportunity: Black/African folklore is iconic, time-tested, and vast. A great place to start is “The Annotated African American Folktales,” which was published in November 2017 by African-American scholar Henry Louis Gates Jr. and Maria Tatar. It’s a groundbreaking, 750-page compilation of African-American myths and legends, considered the most comprehensive and ambitious collection of black folklore ever published in American literary history, with dozens of tales rarely read before. This monumental effort is a gratifying indication that, even though the griot tradition of passing down folklore through generations may be eroding, the preservation of black mythology continues to be viewed as essential for a “liberated” African diaspora cultural tradition.